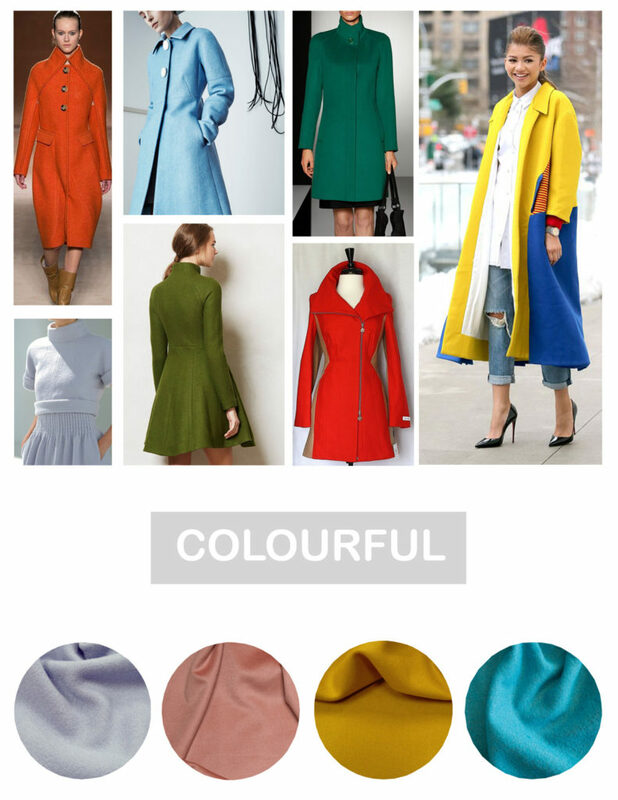 Home Tags Posts tagged with "hemisfèric coat"
We are very excited to share this new video tutorial about the Hemisfèric Coat with you today! It’s a perfect visual help for all of you who don’t feel secure enough to try this project. So, don’t be afraid anymore and take your sewing machine, your fabric and your scissors and enjoy watching our video tutorial! 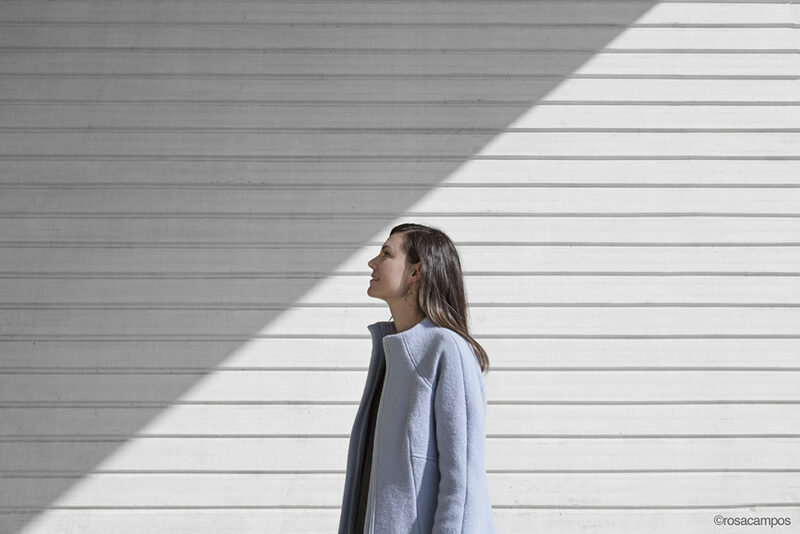 Hemisfèric is a semi-fitted coat that flares at the hips, designed for a B cup and a medium height of 1,65 m (5 ft ). 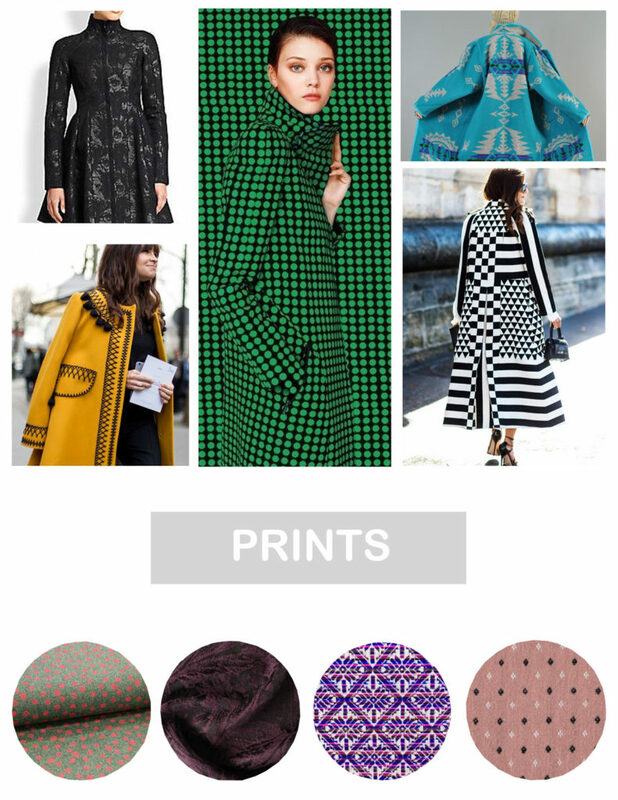 In this post, we’ll share some tips and advices to adapt the pattern to your body. 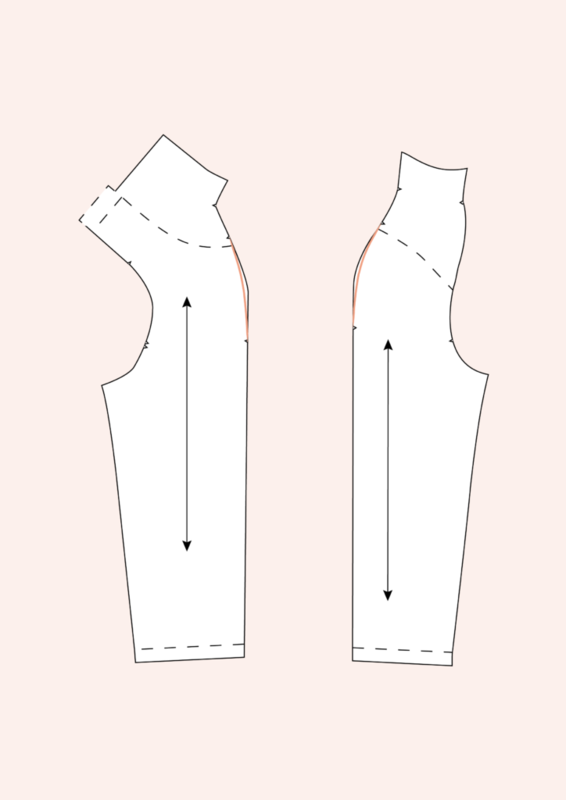 From taking your measurements to sleeve and bust adjustments or coat length, let’s see together how to proceed to these different modifications. The first a important step is to take your measurements. With a measuring tape, take the following measures and compare them to the measurements chart. The length. 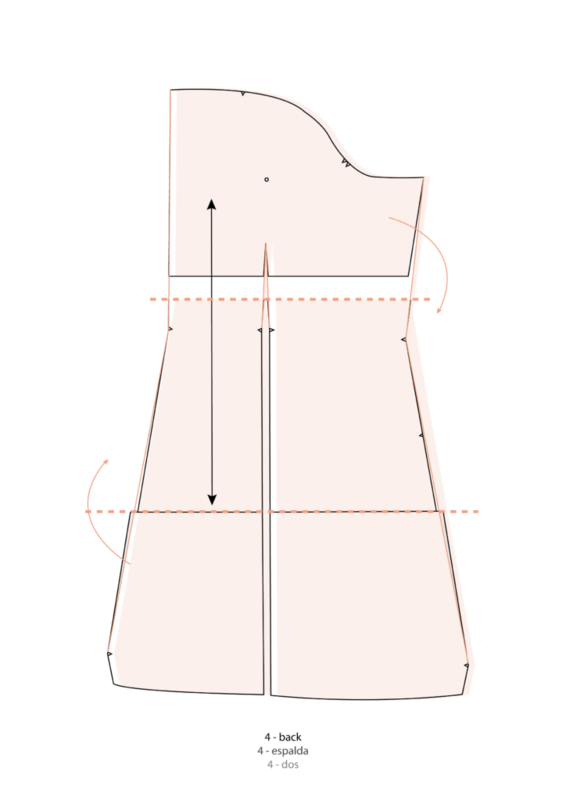 The coat length is measured from the base of the neck (the highest point of shoulder) to the hem, passing over the bust. The bust. Place the measuring tape over the bust, at the apex and make sure the tape is straight in the back. The waist. To measure the waist, place the tape around your waist where it’s the smallest. The hips. To measure the hips circumference, place the tape at the widest, about 25 cm (10″) below the waist. The sleeve length. To measure the sleeve length, place the tape below your arm and measure from the armscye to the wrist with your below slightly bent. The sleeve width. Place your tape around your biceps at its widest. 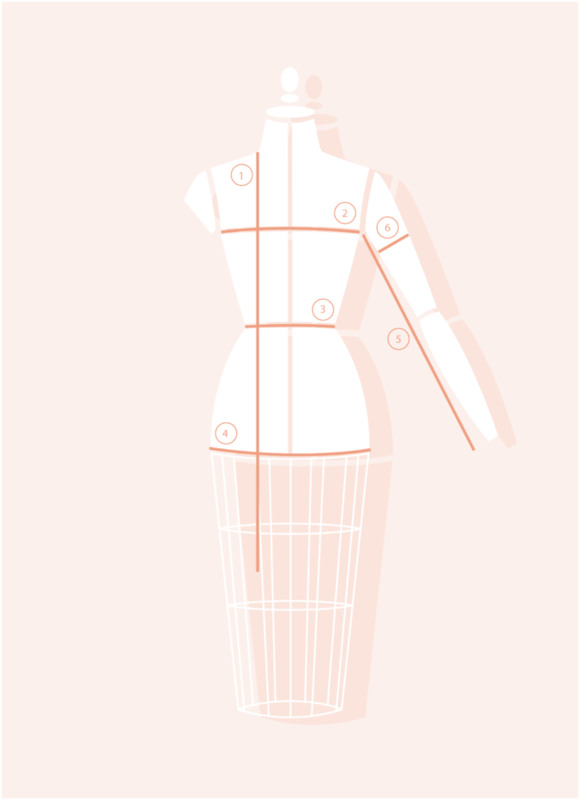 Before making any modification, place the waistline (see the illustration) on your pattern. Trace this line perpendicular to the grainline and make sure they are at the same level on all pattern pieces. We’ll then add the adjustments lines. 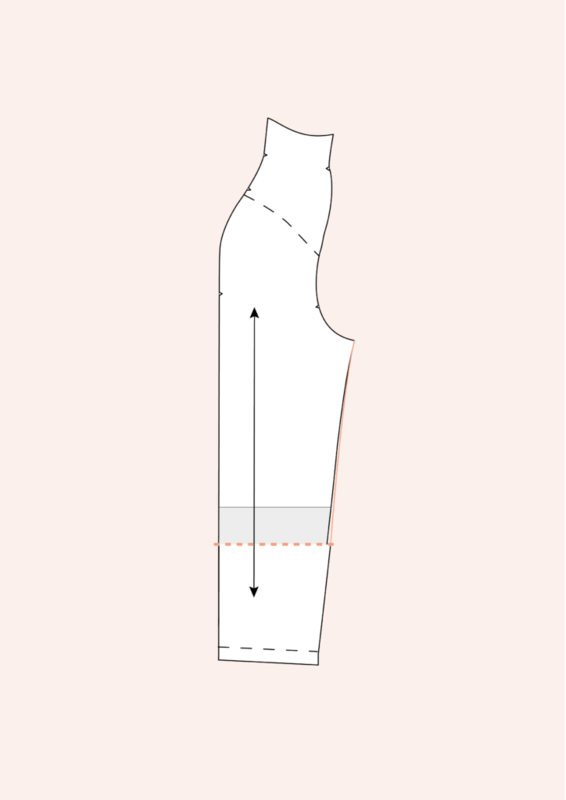 Trace a new line about 3 cm (1 ¼”) above the waistline to adjust the bust length and another one about 30 cm (12″) below the waistline to modify the coat length. 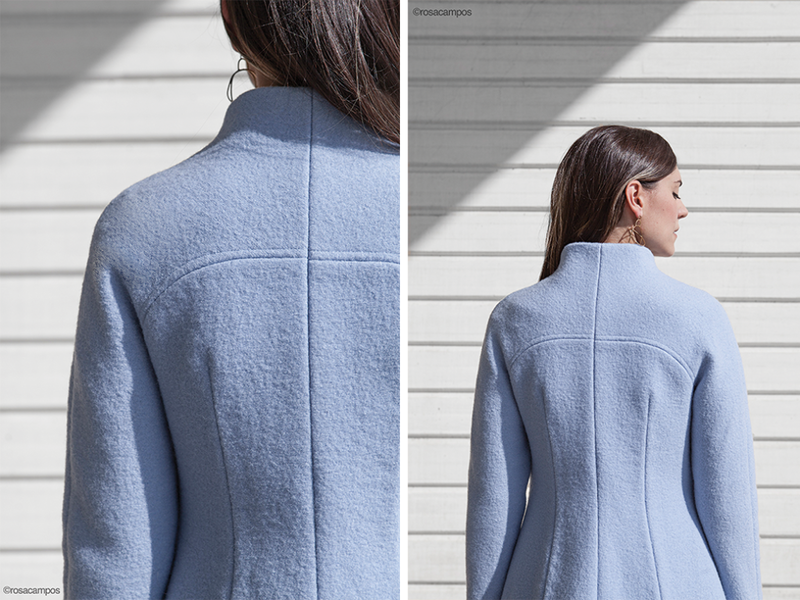 Once these two lines are made, you’ll be able to shorten/lengthen your coat easily. You can apply this method on almost any given pattern to adjust the length. 1 – Choose how many cm/inches you need to remove. Cut your pattern piece along the adjustment line. 2 – Overlay the two pieces the number of cm/inches you want to remove. Make sure the grainline is straight. 3 – Tape the pieces together. 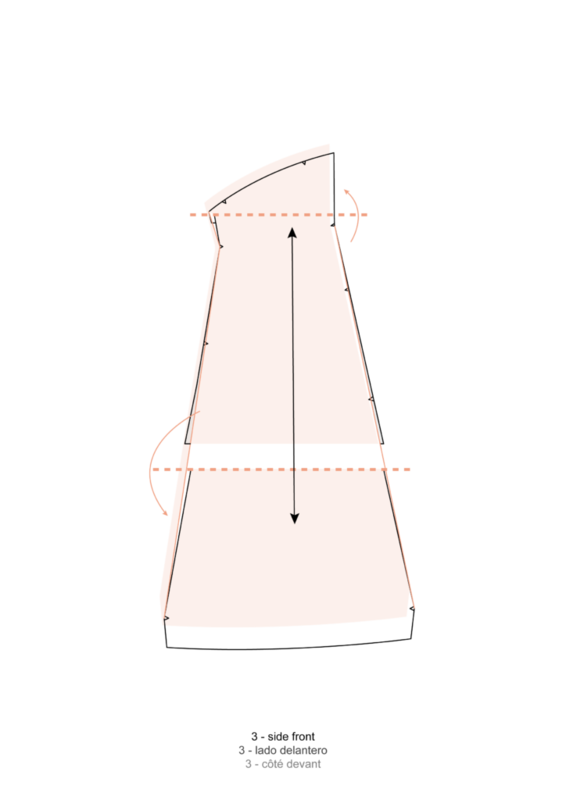 4 – Redraw the pattern shape. 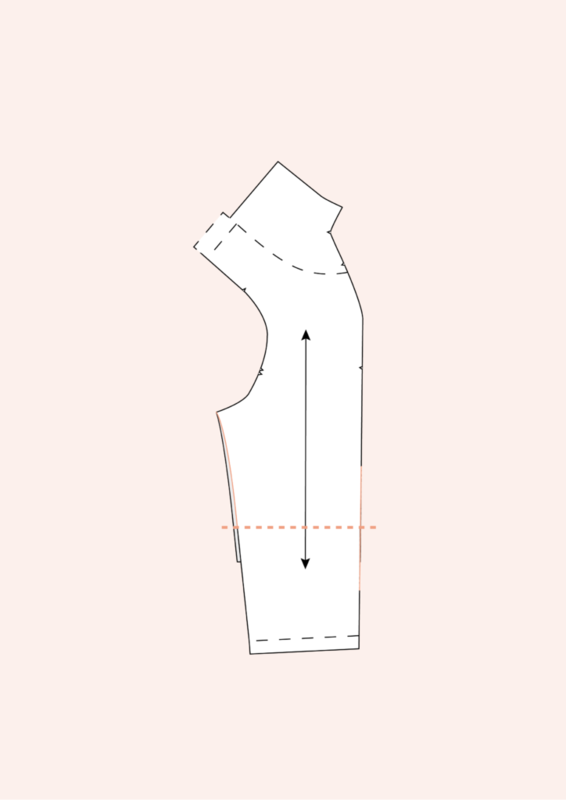 1 – Cut your pattern piece along the adjustment line. 2 – Place a piece of kraft or pattern paper under the two new pieces. Decide how many cm/inches you need to add and spread the two pieces apart accordingly. Make sure the grainline is straight. 3 – tape the pieces to the kraft/pattern paper and redraw the new lines. It’s rather easy to modify a raglan sleeve and adapt it to your arm or shoulder width. Here are some modifications that can be useful. 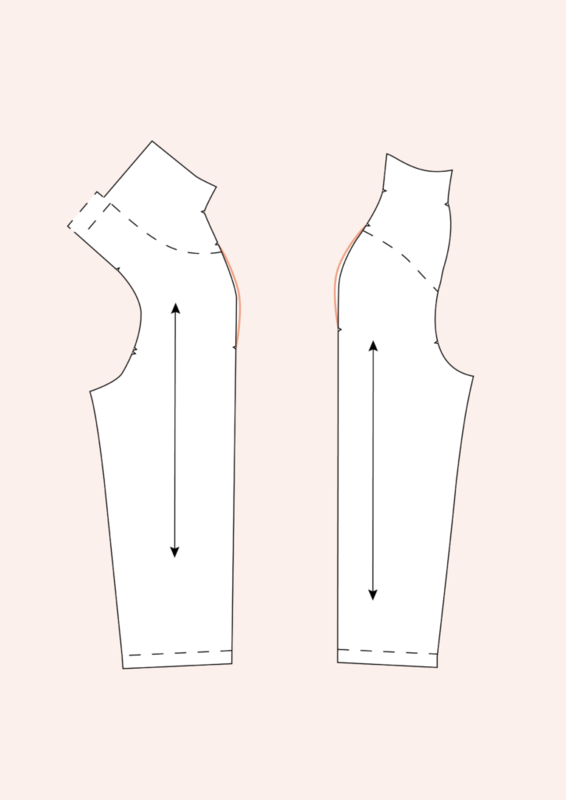 If you have small arms or you want a more fitted sleeve, you can reduce the width on the upper seam of your front and back sleeve pieces, drawing a new line between the top and bottom notches. If the sleeve width seems too tight, you can increase the width over the upper edge of the front and back sleeves like we did to reduce it. As for the coat length, you need to determine how many cm/inches you need to take off the total length of the sleeve. Cut the sleeve along the adjustment line and overlay the two pieces the number of cm/inches needed. Tape the pieces together, make sure the grainline is straight and redraw the sleeve edges. As for the coat, cut your pattern piece along the adjustment line and spread the pieces apart the number of cm/inches you need to add. Tape to a kraft paper and make sure the grainline is straight. Redraw the pieces if necessary. If you have broad shoulders, you don’t want your coat to pull when you move your arms. You need to add some ease at the shoulder edge, on the upper seam of your front and back sleeve pieces. If you have small shoulders, you need to reduce the shoulder curve of the front and back sleeves. 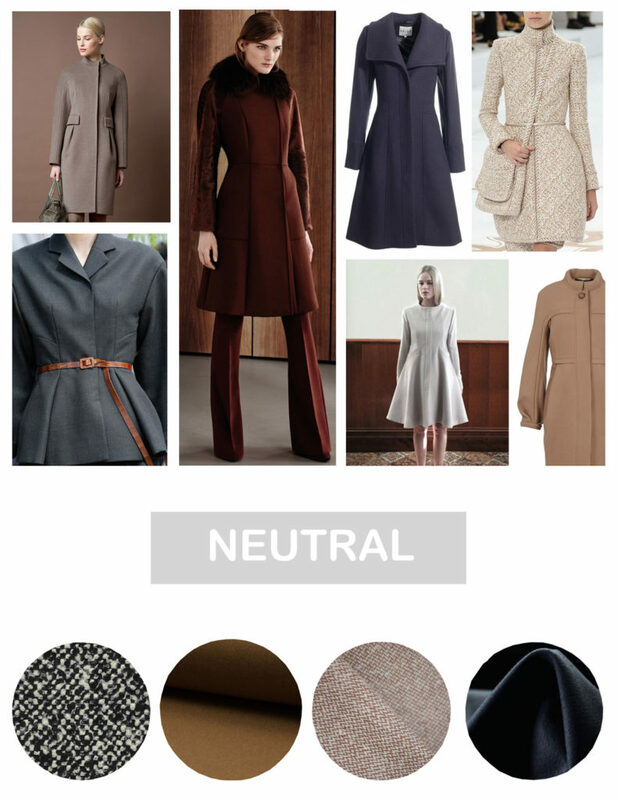 These adjustments are easy to make and will help you get the best fit possible for your Hemisfèric coat! Don’t hesitate to contact us at info@paulinealicepatterns.com or leave us a comment if you have a question.